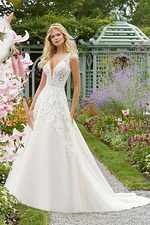 A strapless tulle and satin A-line wedding dress with floral lace appliques, sweetheart neckline and matching long sleeved lace jacket. Shown in Ivory/Light Gold. Available in Ivory/Ivory, White or Ivory/Light Gold.